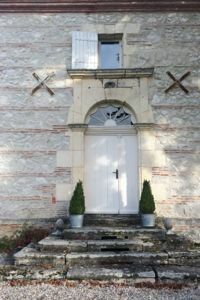 Join us in Southwest France for a five, six or seven night total immersion in the French lifestyle. Pick-up a straw basket and each morning you will visit a different traditional market with your hostess and chef who will teach you how to select the best produce. 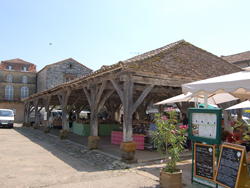 In France gastronomy and life pair with market visits which are a a vital event held on the main square of the town. We will get inspiration for our menu as you shop together, according to the seasonal vegetables and fruits and what the fishmonger is offering that day. 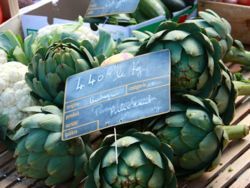 The area is known as France’s orchard and notable specialties include the prunes from Agen and the tomato from Marmande. 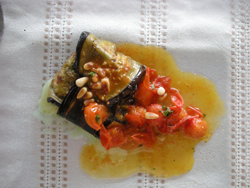 You will learn how to cook in a simple manner without too many complications and conflicts of flavors. We will also give special attention to food presentation, as the eye should first be pleased when the plate comes to the table. 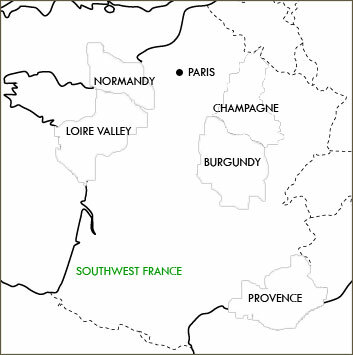 Your hostess was born in the Cognac region in southwest France and studied English and American literature at Bordeaux University. Her love for travelling and sailing took her to the Caribbean Islands where she worked as a chef on luxury yachts. A few years later she settled in Ireland where she opened her first restaurant, soon to receive listings in several food guides, including the Michelin. In 1987 she moved to the Baleares islands in Ibiza to open her second restaurant where she developed her interest in Mediterranean cuisine. Finally settled in the south west of France she is now running her own school where she hopes to welcome you to share with you her knowledge and passion for good food. 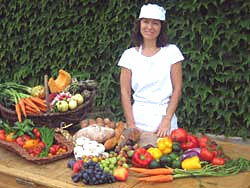 Each weekly program is designed to take advantage of the season’s produce and the special events happening in the area. As well as the shopping trips to the markets and local shops, the program includes visits to vineyards, organic farms, medieval villages and castles, antique markets, local artists and artisans. Each week will be tailored to suit the guest’s desires and special interests. The home you will stay in is named after the two hundred year old mulberry tree which shades the side of the house. An original 18th century “master’s residence” it has been completely restored and has all modern comforts of today while retaining charm and authenticity. The walls are built in white stones mixed with ocre bricks and the rooms have exposed wooden beams, terracotta and oak floors. The house is set in an idyllic rural countryside, surrounded by its own garden, plum orchards, sunflower fields, and a mere two miles away runs the beautiful river Lot. 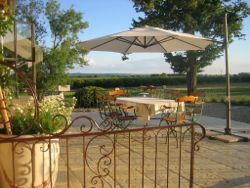 You will have your meals al fresco on the terrace by the mulberry tree or weather not permitting in the veranda. You can relax by the swimming pool, tucked away behind the walls of the old barn, or if you feel active you can take a walk to explore the surrounding area. There are five double bedrooms with queen size beds and they are all individually decorated and cozy. They have en-suite stylish bathrooms, four of them are equipped with large walk-in showers, and one with a retro bathtub with shower. In each bathroom you will find complimentary toiletries and a hairdryer. Afternoon/evening arrival (from 2pm and before 7pm). Settle into the house and over an aperitif we will discuss the coming week schedule before the welcoming dinner which will introduce you to our south-west’s specialties and fine wines. After breakfast we depart to the nearby town of Villeneuve sur Lot for our first market expedition. We discover what produce is in season and wander through the colorful stalls to select the best ingredients for our afternoon class. Lunch is waiting back at the house. (Lunches for the week are buffet style, with a selection of salads, quiches, french charcuterie, cheese board, seasonal fruits, crisp fresh baguette and patisserie from the local bakery). Free time after lunch to relax in the garden or by the pool. At about 3.30pm, roll up your sleeves for your first hands-on cooking class. 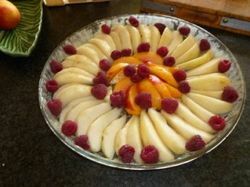 We will prepare a three course meal and many extras in a supportive and friendly atmosphere whatever your skill level. Throughout the week we will cook famous French classical dishes such as Coq au Vin, Boeuf Bourguignon, creme brulée, confit of duck, etc..., and more modern and lighter recipes with emphasis on impeccable presentation. Dinner at around 8pm. We will sample a glass of crisp local Sauvignon before putting the final touch to our afternoon creations. Guests are invited to help to plate up the food to enhance their cooking skills from preparation to service. After breakfast, a five minute drive takes us to the village of Castelmoron for our morning shopping. After loading our baskets we head along the beautiful river Lot to reach a family run plum farm, where a charming pruneau museum will reveal all the secrets of the prune drying business, emblematic of the area. 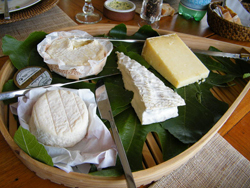 We are invited to sample their home produced specialties, chocolates, jams, chutneys. Lunch back at the house followed by an afternoon hands-on cooking class. After breakfast en route for our mid-week day excursion. The region is famous for its authentic medieval villages. We first stop in Monflanquin, on the list of one of "the most beautiful villages in France", strikingly set on top of a hill. 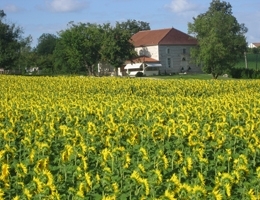 After coffee on the square under the stone arcades, we continue our journey, through a rolling countryside, passing several beautiful castles and sunflower fields. 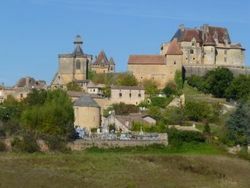 We reach Monpazier, the best preserved bastide in the Dordogne, where many period movies are being filmed. We have lunch in one of the many typical restaurants and you have free time to stroll around the cobbled streets and a chance to shop for souvenirs. End of the afternoon, we are back at the house to prepare our evening meal together. After breakfast we are off to the nearby little town of Ste Livrade. The Friday market is always bustling and we have a wonderful choice of fruits and vegetables, all grown locally. It is also the best day to buy fish and seafood, brought from the Atlantic coast. Back at the house for lunch. 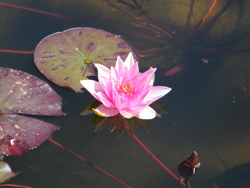 After lunch time to relax or a visit to the oldest water lily nursery in the world! Only 10 minutes from the house, we find the water gardens where the French impressionist painter Monet came to buy water lilies for his garden Giverny. Amazingly, the majority of all hybrid water lilies sold commercially today originate from this small nursery tucked away in a tiny unknown village! 5.00pm hands-on cooking class followed by dinner. After breakfast we are back in Villeneuve sur Lot for our last market visit. There is time for those who wish to walk around at their own leisure, maybe do some shopping. Beware ladies, there is a very tempting shoe shop and many lovely boutiques. Lunch back at the house followed by a free afternoon before getting ready for your Saturday night out! Dinner at one of your hostess' favorite restaurants. This afternoon is the last hands-on cooking class to prepare a festive goodbye dinner. This evening, a champagne aperitif to celebrate the end of a week where we have experienced a new way of living, sitting around the table with friends, good conversation, wonderful food and wine, just enjoying "the beautiful life"
Enjoy breakfast with your hostess. A minimum of 2 participants is required to run this tour and the tour is limited to a maximum of 8 participants. After availability is confirmed, a 30% non-refundable deposit per personand the completed and submitted registration form will secure your reservation. Final payment is due in full 75 days before your arrival date. "AGH quickly identified the cooking experience we were looking for and it was perfect for us. We couldn't have asked for a better experience." "We thoroughly enjoyed our experience with AGH. Getting everything set including a last minute change in guests was very smooth. The combination of excursions and cooking was a great balance and made the experience informative as well as fun." 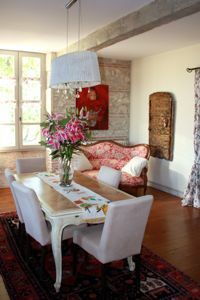 "It was perfect setting french farm house among sun flower fields with our french chef teaching us how to prepare amazing meals and then enjoying the meal with wine and good company out on the terrace in the evening sun. Highly recommend." "Everything was perfect. Was very glad to work with AGH, very effective, quick, to the point. The course put our understanding of French cuisine on a completely differrent level, giving us all the tools to create on our own. Chef's amazing sense of humour and taste of life made the course unforgettable." "Jo Ann at AGH helped us to select the kind of tour we were looking for. On arrival we found our location to be all that we had hoped. The house was a redone/redecorated, complete with pool, farm house from 1850. Our hostess was absoluely wonderful, looking to make our experience one filled with memories to cherish. She succeeded and then some. We already miss her!" "The week was one of the most enjoyable that I have spent during many travels abroad." "I was incredibly pleased when dealing with AGH. I signed up, then almost immediately had to put a stop payment on the check and cancel because of a medical problem. AGH was very understanding. Then, only a couple of weeks before the course, I felt I would be able to partake and contacted AGH and was told there was still space available so I again signed up. I'm incredibly happy that I did. It was an absolutely marvelous week. The accommodations were superb, I loved the course and the host. All in all, a fantastic experience that I hope to be able to repeat, perhaps in Italy next time. "My husband and I agreed that this was one of the very best vacation experiences we have ever had or could imagine!" "Six of us did the five-day class in September and had a wonderful time. The farmhouse is gorgeous, beautifully decorated and totally comfortable, from the bedrooms and baths to the living room and kitchen. The experience was what the website promised and more." 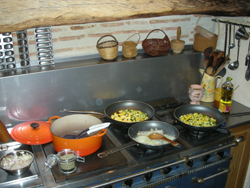 "Our Active Gourmet Holiday (Cooking in the Dordogne) was perfect – fantastic, actually. Six foodies from St. Louis, Chicago and Michigan did the 5-day cooking school, and I could have gone home happy after that, although we tacked on several more days touring on our own. Our hostess and cooking instructor/chef was very knowledgeable, creative and -- fun. Her large home is comfortable and attractively decorated; bedrooms and private baths were lovely. I especially enjoyed going to the various markets and picking out foods to prepare for that night. Also I liked the fact that most of the recipes will be very do-able in the U. S"
"Dear Jo-Ann, We had an amazing trip to France. We would have never found Sylvie without you. It was so reassuring to have your advice and "shepherding" as we planned our trip. 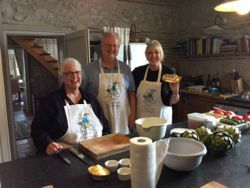 We spent 5 glorious days in the Dordogne Valley where we cooked, napped and saw the sights at our own pace with our hostess Tres Bien, Sylvie. Thank you for leading us to her! My mother-in-law, my daughter and I had a trip of a lifetime with memories (and recipes) we will never forget! "Wonderful food, great accommodations, fantastic teacher. We felt like royalty." "Last summer my husband and I attended this cooking school. The highlights at were a small very compatible group of six persons, interesting menus including many vegetable dishes that were new to us along with excellent fish and chicken, the atmosphere was consistently relaxed, the accommodations were lovely--we had a beautiful room with private shower, a pool on the premises, living room and dining area were nicely appointed. We have used many of the recipes since we have been home; this is not always the case. Above all, we were so satisfied last summer , we intend to return in '08. Sylvie's has everything we could want in a cooking school vacation." "For the past few years I have enjoyed one week each summer as a guest in Sylvie's home and a student in her kitchen. I'll be back again this year because I can't imagine a summer without this experience: seeing the French countryside, visiting the local markets, and cooking the wonderful foods that are that country's bounty." "AGH made things easy for me, I got all the information I needed on a timely basis and the enrollment process went very smoothly. I loved my experience in France, the place was so beautiful and peaceful and the cooking experience was amazing. I loved going to the outdoor markets in the mornings and buying the products produced by the locals and it was so much fun to cook delicious meals in the afternoon." "Great accommodations; wonderful and warm people; memorable cooking lessons; amazing food at all meals; beautiful landscapes."